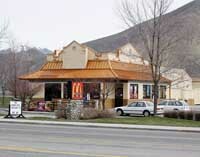 The Hailey McDonald's saw a spike in job applicants Tuesday as part of the chain's National Hiring Day. General Manager Ryan Kyle said 25 people stopped by the McDonald's location on Main Street to submit applications for the restaurant's open positions. "I've narrowed it down to about 10, and we're going to hire five out of those 10," Kyle said. The hirees will begin as crew members, which the job description on the McDonald's website describes as a "McDonald's ambassador." Crewmembers work the counter, prepare food and provide customer service at the window. However, the positions come with upward mobility. "I start everyone at crew and they work their way up the ladder," Kyle said. According to McDonald's, more than half of franchise owner-operators started off behind the counter, and 75 percent of restaurant managers worked their way up from a crew position. The Hailey location currently has 30 employees. Kyle said McDonald's was hiring to prepare for the summer season. "During the summer months, we see a lot of travelers just passing through," he said. Nationwide, the chain is set to hire up to 50,000 people. "It's pretty cool for one organization to hire 50,000 people in one day," Kyle said.